Network, Customer, Host, Team Member - follow my system! As you know I have built my Thirty-One business to a team of over 1,400 consultants and I get asked daily.... "HOW DO YOU DO IT?". I will first tell you that it isn't easy but it sure if fun (obviously) - when have you known me to do anything that wasn't fun by choice...NEVER!!! You first can not expect this to happen over night and you also have to realize that not everyone you talk to is going to be your ideal team member - you also have to nourish a relationship with that person before jumping on them with the opportunity to join your team. I was recently on facebook and came across a great social media post about a women named Belinda Ellsworth, Direct Selling Expert - Step Into Success - she is amaaaaazing!!! She had a post about this very topic and may have been the inspiration behind this exact post. Thanks Belinda! If you are looking to build a large team it is all about inviting them into your system. I know many of my new and veteran consultants feel overwhelmed by getting customers, finding hosts, and looking for new team members all at the same time. I am here to tell you SYSTEMATIZE IT!!! Let's begin with your NETWORK: it is important to build relationships with people so they get to know you, like you, and trust you and eventually buy from you. Belinda had some great suggestions for this such as starting a Facebook Business Page to build your community, offer a VIP group on Facebook and network network network. Referrals are where it is at. By building this community of friends and "who you know" you are going to expand your scope of reach and soon those friends will become customers. The next step is CUSTOMER: Once that friendship is built and they know you truly care about them. They will see the products you have to offer and start to inquire. These customers will help you reach your goals every month and be an even bigger asset to your business and refer you their friends and also become repeat customers themselves. I can not tell you how many of my customers are repeat. Very rarely do I have someone order and then never order again. The next step is HOST: Your customers are going to be your best hostesses. They know your heart and have used the products themselves and want to share their great experience with their friends. The parties will not only help you reach your goals but they will introduce you to new customers to keep your system consistently flowing. The last step is NEW TEAM MEMBER: Your host can enter into this phase and join your team and become a consultant themselves. Your best leads to hostesses are current hostesses. They know the product, love you, trust you, know your personal why, and want in on the fun! They want to be able to add to their income and have a great time doing it as they have seen you do. By following the system and keeping your system full you can ensure yourself success. Not only will your income increase but your time management, business success and productivity will improve too. Hey ladies!! 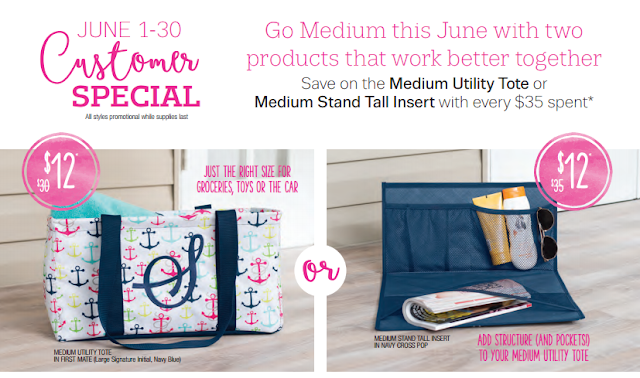 Check out this fabulous customer special for the month of June!!! Go Medium this June with these two great products that work together or apart!!! Throw your snacks, towel sunscreen, a good book and sunglasses in this tote and hit the beach. Then use the insert to keep it all at your fingertips while your soaking up the sun.